We’ve been drinking in the glory of high-def tv this week with the sumptuous floral close-ups of Sarah Raven’s latest Bees, Butterflies and Blooms episode. Unfortunately Britain’s insects are drinking very little in gardens that lean heavily on double begonias, busy lizzies and other flowers that offer no pollen or nectar. They are empty: their sweet nectary bits have been bred out of them, in exchange for extra petals and other showy attributes. (Jump to the bottom of this post if you want tips on how to choose flowers that are bee-friendly). Our garden here at Mercat Cottage is fairly buzzy with flowers that make insects happy, from the February crocus to the early November cosmos daisies. This flower choice was more through accident than art; so was our choice to put in a pond, which was really meant for the newts and slugivore frogs, but which I’ve learned is vital for bees, who consume litres of water. (In this week’s episode, Sarah Raven’s beardy garden naturalist told her she could bump up the wildlife value of her walled garden “two points” by adding water). 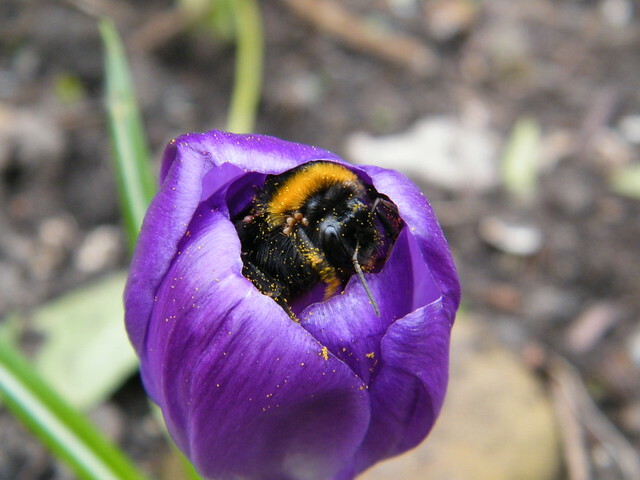 The “perfect for pollinators” initiative launched by the Horticultural Trades Association and the RHS, also discussed in this week’s show, was probably the single most important blow for Sarah’s campaign. Gardeners need advice at the point of sale, and the yellow and black logo will now make it easier to choose pollen and nectar-rich plants in the garden centre. It’s a shame it’s taken so long to do something so sensible; gardening magazines, even those I love, haven’t done enough to drive home the urgency of the biodiversity message. The magazine messages I remember about pollinating insects and garden plant choice have been along the lines of, “double plants don’t do much for bees.” After listening to Sarah, I think her alarmist opening gambit (“pollinators are in crisis and we gardeners have to act now”) is more appropriate at this stage of the game: three species of bees are extinct and hundreds more insects are on the brink because traditional habitats (country wildflower meadows) have been replaced by modern farming methods. The millions of hectares of British back gardens could feed rather than frustrate pollinators who land on our flowers looking for a nectar payload, not just pretty colours. My husband calls the foodless plants — like the double begonias — “Franken-flowers” and he’s right. Over-bred and over-valued by gardeners craving a “wow” factor, they could easily be exchanged for colourful and nutritious alternatives, flowers that take care of the “wow” as well as the welfare of insects. Don’t forget, they’re the ones who pollinate the crops that feed our families. It’s fair to ask the question, and I did once, when speaking to an ecologist. I’m a writer by day and was doing a brochure for a university wanting to attract more students to study science at third level. I asked him why biodiversity — multiplicity of habitats and species — is so important. He told me the stories you’ve probably already heard, but which were new to me in 2009, about the disappearance of bees in parts of China, where crops now need to be hand-pollinated by humans. That’s expensive — but it’s also the beginning of who-knows-what kinds of chain reactions in the environment. Biodiversity, the ecologist said, is like the rivets in an airplane: lose one habitat or species, and it may not matter; but you never know which loss will trigger the catastrophe. In the cutting garden I’ve been planning as part of my New Year’s Gardening resolutions, I’ll have lots of sunflowers, lemon basil and zinnias. I’d thought about skipping the sunflowers, but now that I know the bees and other insects need them badly, they’re going to make the cut. Visible pollen: If you can see the yellow centre, there’s probably something there for bees. Bees need daisy-like flowers and other “singles” that aren’t so packed with petals you can’t see the flower’s reproductive bits. Variety of shapes: Imagine a crocus, a foxglove, a daisy, a buddleia (butterly bush), an achillea and a lily. From trumpet shapes to goblets, flat landing pads to long clusters of close-packed flowers, all require the insect to work in a different way to get the pollen and nectar. This attracts and feeds a wider range of insects than loading up your garden with a single flower type or shape. Early to late: Look for plants offering food in the quiet periods like February and October…fill any gaps like these with flowers guaranteed to offer nectar and pollen, so insects never go away empty-handed. No excuse for no water: If you’ve no water already, go outside today and fill a large drip tray or shallow bowl with water and put a stone in the middle for insects to land on. Tiny ponds are also cheap to buy and easy to maintain, if you’re feeling more ambitious. Remember the Yeats poem about his desire to live in a “bee-loud glade”? 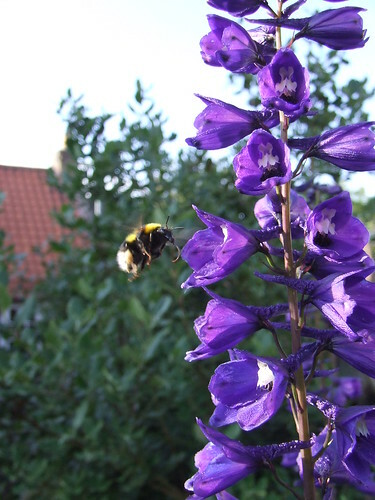 Imagine if British domestic gardens were full of bee-loud borders. We may live in imperfect and troubled times, but still — what a wonderful world that would be. One of the more annoying articles I’ve read recently went back to that old chestnut about draining gardens down to a sump and then connecting it up to a mains drain! Besides being a terrible thing to do for the drains (and illegal if you don’t get permission from the water companies) to put all that silt in, it is also terrible for the water table which needs every litre it can get right now. Draining your garden down to a pond on the other hand provides lots of lovely opportunities for newts, frogs and birds as well as the dragonflies and bees. Agree on the comments above, fully draining gardens is a real problem. We try and trap as much as we can rather than let it go to waste. The bees are fantastic, many of the plants we grow are species rather than hybrids, personally i think you get better plants, and hopefully better for the bees too! An excellent article — and one that can be applied to all parts of the globe. Many thanks for raising awareness. One of the best plants for bees and butterflies is lavender. If you look at jars of honey you’ll often find that they are associated with certain plants – for example – orange blossom honey , manuka honey and heather honey. Plant some of these and the bees will come, the bees will come. Enduring Gardener- My lavender struggles (cuttings take forever to grow and my main bush was never very floriferous). I think I’ll treat myself to some healthy new plants, and call it part of my bee budget. Thank you for the idea! Great post. I love my bees but have to admit my lack of concise knowledge on how to feed them throughout the year. Thanks also to Kate’s post I now have more info. Hopefully this year will be a good one for the bees here! Plants I find that attract bees are sedums, cotoneaster, ivy, Sorbus, Buddleias to name a few. One of my clients has her own bee hives and the honey she collects is beautiful, she also makes her own honey and raisen bread and believe me if you tasted it you would keep your own bees too. Let me have a think Joanna… does the garden have shelter or is it quite windy?